I had no idea how easy it is to plant green onions, so I'm guessing many of you reading didn't know either. I needed green onions for a recipe this week so I bought some (99 cents a bunch), but then what do you do with the white, rooty ends of the onions? Throw them away? WRONG! You can plant them and they'll grow more green onions. Pretty sweet, huh? I had no idea, I saw this idea on a blog somewhere and decided it was worth a try. 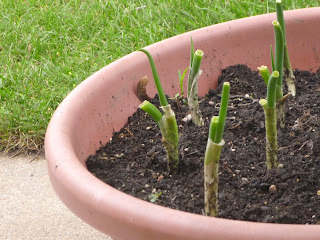 I cut each green onion a couple inches above the white part and planted it by burying the white part of the onion. Most have new shoots growing already (the photo above was taken a couple days after planting) and all of the previous shoots have grown significantly. 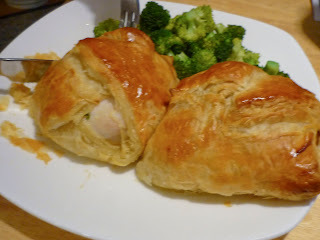 Now you know ..
And if you must have all things green onion, bacon, chicken and cream cheese, then for the love of all things wonderful and delicious, try this recipe. You won't regret it.